Kanye West. Kesha. Kendrick Lamar. Gustav Mahler. It’s a unique combination of artists, to say the least. 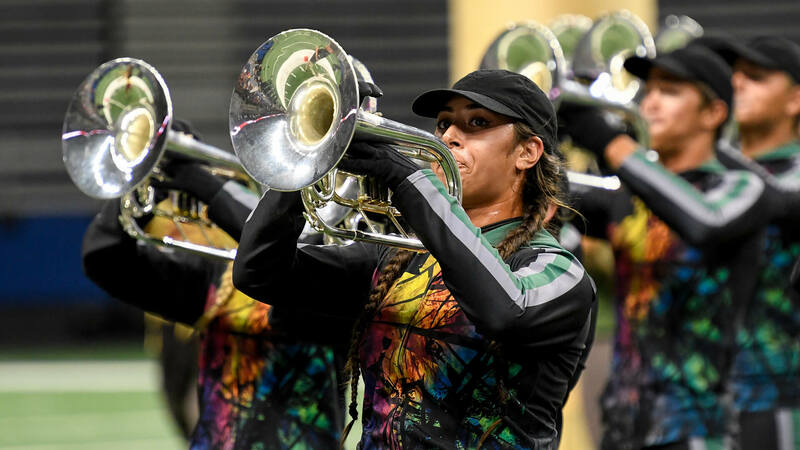 Over the past two years — the corps’ fourth and fifth in Open Class — it’s a type of repertoire that’s starting to become the norm for the Houston-based Guardians. The corps’ 2017 program, “My Beautiful Dark, Twisted Fantasy,” which dove into the mind and music of Kanye West, was a significant and successful jump in a new direction. Simply put it, it worked. “When we saw that the kids really bought into last year’s product, to us, that’s the most important thing about what we do,” Doerr said. “We want to make sure that they love what they’re doing and what they’re performing, that they feel that they look good, that they feel like they sound good, and that’s all that really matters to us at the end of the day. Guardians mellophone players perform, July 21 in San Antonio, Texas. “Damned.,” according to Doerr, is loosely inspired by Kendrick Lamar’s Pulitzer Prize-winning 2017 album, “Damn.” Through the visual cues of tall pillar props that come together to form a church of sorts, Guardians’ program follows a path from damnation to salvation. While the music selections that tell that story may not be recognizable to everybody, the hope, according to Doerr, is that they’re used in ways that still make sense to the overall theme being portrayed. For example, Kesha’s 2017 song, “Praying,” may not be on the day-to-day playlist of the average spectator, but its inclusion at the end of the show to signify redemption still makes clear sense in the context of the production. “We use music that is pretty fresh, and it’s something that, sometimes, the judges might not be familiar with, but we try to use it in a way that gets the point across without them requiring the knowledge of that type of music,” Doerr said. 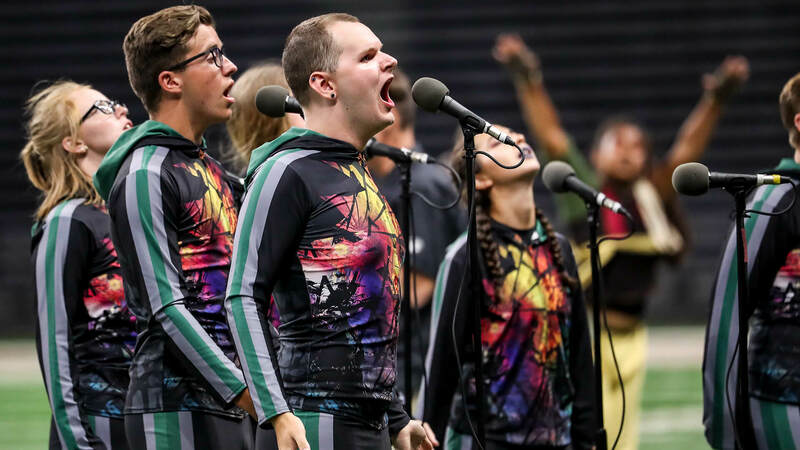 A vocal ensemble is an integral part of Guardians' 2018 production, "Damned." According to Doerr, the use of popular music has allowed members to take what they’re doing throughout the summer and connect it with their friends and lives back home. 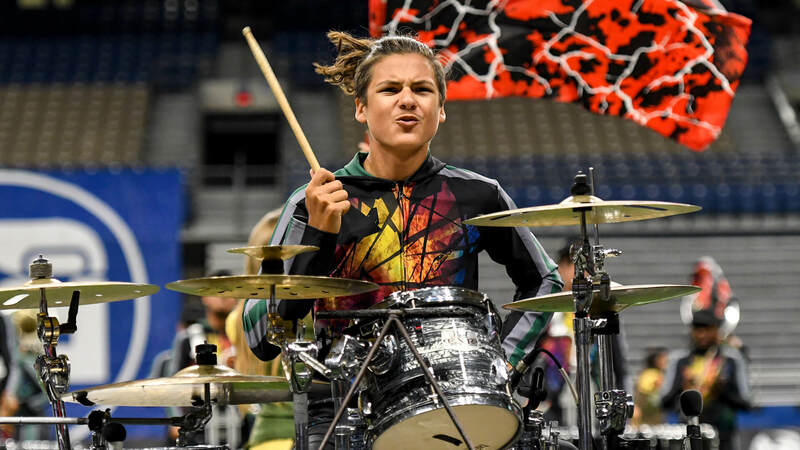 And with his corps’ membership clearly on board, Doerr and the Guardians seem to have found their own niche — one previously untraversed and certainly turning heads — in the drum corps activity.